Thank you very much for supporting our 2016 Bon Dance! 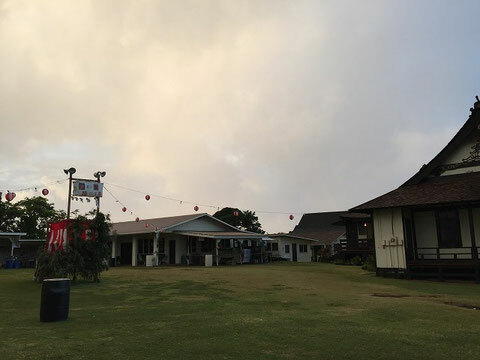 Bon Dance at Koloa Jodo Mission was finished last night. My sincerest Mahalo to our members, friends, helpers and participants. Thank you very much for supporting our Bon Dance. For this Bon Dance, I did work hard both praying and preparation such as writing O-Toba, Ko-Toba, making Toro Lanterns, O-Bon decoration for the temple, yard work, and shopping supplies. I did without having a vacation during the summer. I only took four days of day-off in order to do another job of guiding and entertaining my guests. Therefore I couldn't have a chance for family trip. But this year Bon Dance was absolutely worth spending my energy and time because I was able to deepen my gratitude for our members and helpers who also spent so much time and energies for our Bon Dance. I realized many of our helpers came to help by using their money of traveling, car and gasoline. At the same time, they used their vacations or free time in order to help us. The more they help us, the more they would lose their free time. On the other hand, I'm paid for what I do for the temple. So it is nothing special to work hard for the temple. Rather, since I get a paycheck, I have to work hard, that's my duty. Now I deeply realize I am living here thanks to the many people's kindness, compassion, good will, and sacrifices. I thought I was the one who was helping people but the truth was the opposite. People are always helping me and I'm so grateful for this fact. Once again, thank you so very much for your support to our Bon dance. Because I've received so much kindness, I want to be kind to others more than ever.